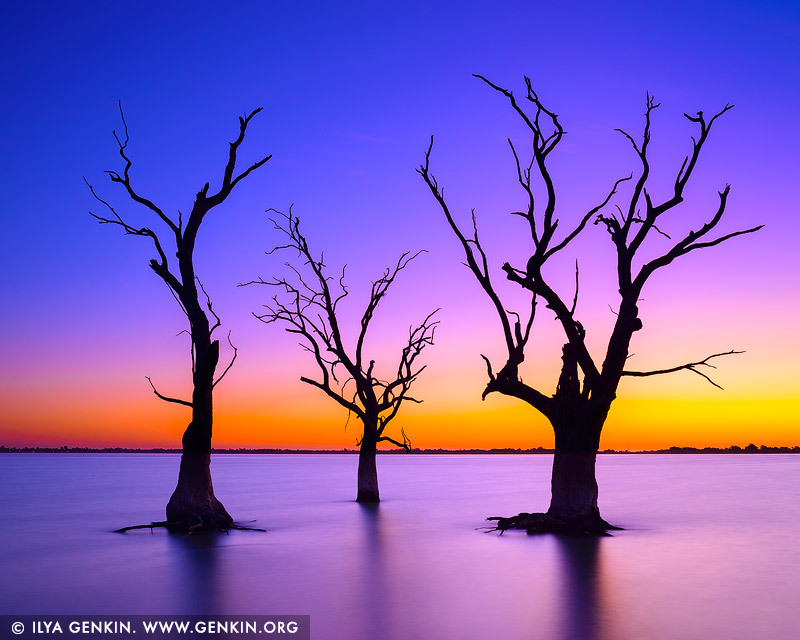 Dead trees in the waters of lake Bonney at colourful and vivid sunset. Lake Bonney is a freshwater lake located in the Riverland region of South Australia. The lake is fed and drained by the River Murray. The town of Barmera is located on its shores. Barmera is the jewel of the Riverland. The geographical centre of this amazing place is the sparkling fresh water lake which is safe for families, making Barmera the ideal location for your holiday experience. The lake is magnificent at sunset when dead trees are silhouetted in the setting sun. This image belongs to the travel and nature stock photo library. This stock photo of Sunset at Lake Bonney is available for licensing for commercial and editorial uses including websites, blogs, books, magazines, brochures and advertising. Restrictions may apply for images which contain third party copyrighted material or sensitive subjects. Photos of artwork are for editorial use only. This image id AU-LAKE-BONNEY-RIVERLAND-0001 of Sunset at Lake Bonney, is copyrighted © by Ilya Genkin. This is not a public domain image.